Welcome to the McCormick Villages website. Scroll down to find out more about our plan for this historic factory in London! Known as the Sunshine Palace, the McCormick factory was constructed in 1913. The factory was one of the first large industrial factories in London and played an important role in the development of east London. The factory was constructed and designed by Thomas McCormick Jr. and his family. In order to design the factory, Thomas Jr. toured over a hundred candy and biscuit factories in Europe. London’s Watt and Blackwell architectural firm helped make his dream a reality, and the factory was soon constructed by the Frost and Winchestor construction company of Windsor. The original factory was created with the Kahn system of reinforced steel encased in concrete. Large windows were incorporated into the design to allow workers access to sunlight. Terra cotta was added to the exterior cladding of the building, adding to the building’s unique features. Employee amenities included croquet, a tennis court, baseball field, and lawn bowling on the extensive grounds. Over a thousand people worked in the factory on a typical day, producing 135,000 pounds of candy and 100,000 pounds of biscuits a day. The factory operated as a candy and cookie factory under various corporations until 2006. The site has remained vacant since the last business, Beta Brands Limited, went into receivership in 2008. The City of London vested the land due to nonpayment of taxes and issued a request for proposals for the purchase and redevelopment of the property. As part of the sale, a Phase 1 and Phase 2 Environmental Site Assessment and a Designated Substances and Hazardous Materials Survey were completed by LVM/Sendex (now Englobe). These studies identified substantial site and building contamination and the presence of many hazardous materials. Sierra was the successful purchaser, and ownership of the property officially transferred to McCormick Villages Inc., a subsidiary of Sierra Construction Inc., on March 15, 2016. As part of the Agreement of Purchase and Sale, the City of London initiated Official Plan and Zoning By-law amendments to allow the site to be developed for commercial and residential purposes. These amendments were passed and adopted by London’s City Council in December 2015 and were not appealed. The approved zoning includes Urban Design Guidelines, and a public site plan is required. A heritage alteration permit will also be required to ensure the rehabilitation maintains designated heritage features. * information on history and historical pictures are provided by the City of London. 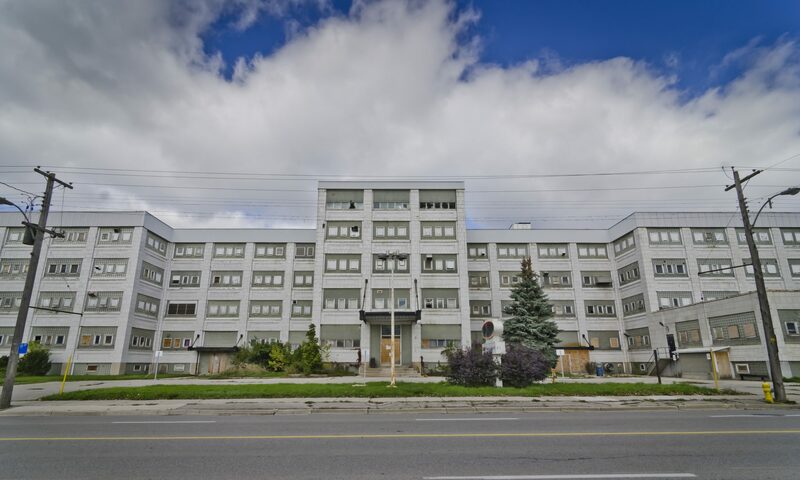 The proposed redevelopment of the McCormick property has been formulated with the assistance of the City of London through the Official Plan and Zoning By-law amendment process, and will be further refined via a public site plan and additional studies. As part of this plan, the heritage-designated portion of the McCormick building will be rehabilitated to contain mixed uses, including residential, office, and/or commercial uses. The non-designated additions to the building will be demolished. A look from the roof down into the building. The rear of the site is proposed to contain a senior citizen housing development that includes townhomes, apartment buildings, and a retirement home. Gleeson Street will be extended from Ashland Avenue to McCormick Boulevard, and single detached dwellings will be located at the extreme north end of the site. With the exception of the Gleeson Street extension, the site will be accessed by private roads. A public park is to be located at the south-east intersection of Gleeson Street and McCormick Boulevard. Outside look at the east end of the building. Due to the site’s former industrial use, the property and factory are highly contaminated and will require extensive remediation. Approval authorities will have many opportunities to oversee the continued development of the project, as redevelopment will require a Record of Site Condition, a Heritage Alteration Permit, a public Site Plan review, a Zoning By-law amendment to remove Holding provisions related to the submission of various reports and studies (including a Traffic Impact Study), and building permits. In addition, the site is subject to Urban Design Guidelines that will ensure the redevelopment achieves a high design standard. Interior look at the building’s condition. See below for development maps, architectural renderings, as well as the zoning by-law amendment and the Official Plan amendment. June 23, 2017 – Website Launch! The McCormick project was recently approved for funding under the City of London’s Brownfield Community Improvement Plan. Building and site rehabilitation is expected to begin winter 2017/2018.